Several swimming holes in river/creek along trails in Lester Park in Duluth within sight of Lake Superior. This from a visitor:” In the City of Duluth, Minnesota's Lester Park, which is located on the Amnity Creek and the Lester River , are three popular swimming holes - all within the park. Lester Park covers rocky, tree filled land that starts 600 ft above Lake Superior and drops to Lake Superior, within a distance of less than a mile. Lake Superior is between 601-602 feet above sea level. The Amnity Creek and the Lester River - both about the same size - flow through the park's rock-lined gorges, and over boulder-filled beds and many waterfalls, to merge near 61st Avenue East and Superior Street, where they flow over there final waterfall - about 30 feet high - to Lake Superior." "Within the park, and on the Amnity Creek, near Occidental Boulevard and Seven Bridges Road, is a very popular swimming hole at the base of a 30 foot waterfall. The area surrounding this swimming hole is rock cliffs and ledges and 80-100 year old Cedar, Pine, and Spruce trees. On the Lester River, within Lester Park, and about one-half block upstream from East Superior Street, is another very popular swimming hole at the base of a 4-5 foot waterfall. This swimming hole is also surrounded by volcanic rock. 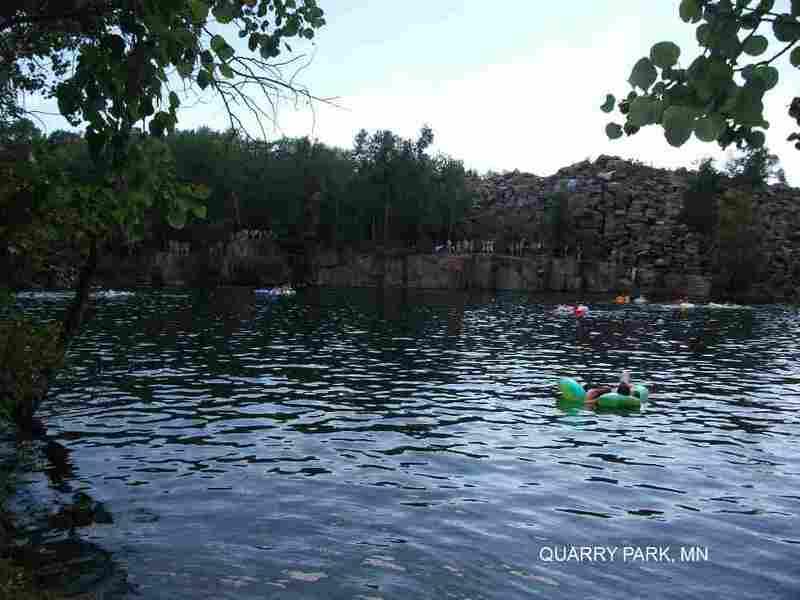 Again on the Lester River, within Lester Park, and about one-quarter block downstream from East Superior Street, is a 40 to 50 foot deep swimming hole located in a narrow rock gorge, with 60-80 foot rock walls (known as "The Deeps"). Swimmers jump from a bridge that crosses the gorge to the river below - the jump is at least 80 feet to the river. CAUTION: Jumping from this height is very dangerous and, at this location, there is sometimes debris in the water and strong currents. People have died here in recent years due to the strong currents. DO NOT try to swim here when the current is strong. Each of these rivers are as clear and clean as bottled water in a crystal glass, as is Lake Superior." Lester Park is on the east edge of Duluth between 60th and 61st Avenue East. .
Official swimming and scuba diving (and rock climbing) at County Park that is a water filled quarry 116 feet deep. A second swimming hole here has recently (in 2014) been developed - said to be more family-accessible with a beach area. Most of the beautiful St. Croix River is too shallow for swimming but here are a couple of places you may find the depth required. It is mostly a canoeing and tubing river. For details, see DIRECTIONS below. Commercial camping along river at Limestone Park. SUNRISE FERRY LANDING [SUNR]: Most of the beautiful St. Croix River is too shallow for swimming but here is another place you may find the depth required. It is mostly a canoeing and tubing place. From North Branch (above), keep on RT 95 east as it jogs around for about 8 miles then turn north (left) onto Sunrise Rd and go about 2.5 miles then take a left on Mill St. The parking lot for the tube rentals is at this intersection (45.546409,-92.85664) (behind the bar). If you have your own tubes, stay on Sunrise past Mill Rd. then take a slight right onto Ferry Rd and go 1.4 miles to Sunrise Ferry Landing. (parking fee)LAT, LON lat=45.56672, lon=-92.86489(source: Map) (accuracy:approximate) LINK TO GOOGLE MAP. Pretty confident. Verified by another. Updated 1/2014. FRANCONIA BRIDGE [FRAN]: Swimming hole at the bridge over the St. Croix River between Franconia MN and Osceola WI. The St. Croix National Park boat landing is under the bridge and the picnic area is adjacent. It has toilets, maybe drinking water. Best swimming is on the river side when the river is low, otherwise there is an official beach on the slough on the west side of the picnic area. From North Branch, keep on RT 95 (St. Croix Trail) east as it jogs around (go past Sunrise Rd. above) then turns south then cross the river at Taylors Falls onto RT 8 east and enter WI (all told about 20 miles from North Branch). In WI, turn south on RT 35 (right) and stay on it as it twists around for about 8 miles to Osceola and another bridge over the river (back into Franconia, MN). The swimming place is at this bridge. LAT, LON lat=45.3201, lon=-92.715287(source: Map) (accuracy:approximate) LINK TO GOOGLE MAP. Pretty confident. Not verified. Updated 1/2014. Unofficial swimming holes in State Park rivers/falls between Duluth and Grand Marias along the shores of Lake Superior. For details, see DIRECTIONS below. None at Tettegouche if you park in the Hwy Rest Area, probably an entrance fee at Gooseberry S. P.
Camping at both state parks. GOOSEBERRY S. P.[GOOS]: Gooseberry State Park has the large, warm Gooseberry River with lots of swimmers. (no detailed information about where exactly to swim in river). STATE PARK WEB SITE , MAP SHOWING RIVER AND TRAILS. To get here from Duluth, Go about 45 miles north on RT 61, past Two Harbors, to Gooseberry Falls S. P. and scout out the river. (no detailed information about where exactly to swim in river). LAT, LON lat=47.13836, lon=-91.47079(source: Map) (accuracy:approximate) LINK TO GOOGLE MAP. Pretty confident. Not verified. Updated 1/2014. TETTEGOUCHE S. P.[TETT]: Swimming hole at the bottom of cascading 60 ft. High Falls of the Baptism River in Tettegouche State Park. STATE PARK WEB SITE , MAP SHOWING REST AREA AND HIGH FALLS TRAIL. To get here from Gooseberry S. P. (above), continue another 15 miles north on RT 61, past Silver Bay, to the next highway rest area, near Tettegouche S. P.. Park at the rest area (unless you are going into the State Park) and hike on the High Falls Trail (northeast out of the rest area) a short way to a footbridge over the Baptism River at High Falls and the swimming hole below. LAT,LON (Rest Area) lat=47.33711, lon=-91.20219, (source: Map) (accuracy:approximate) LINK TO GOOGLE MAP Pretty confident. Not verified. Updated 1/2014.